SFA designed a complete renovation of Lehigh Hall, a dormitory built in 1962, to provide students with upgraded facilities to meet their needs. Kutztown University’s Lehigh Hall was originally built in 1962. 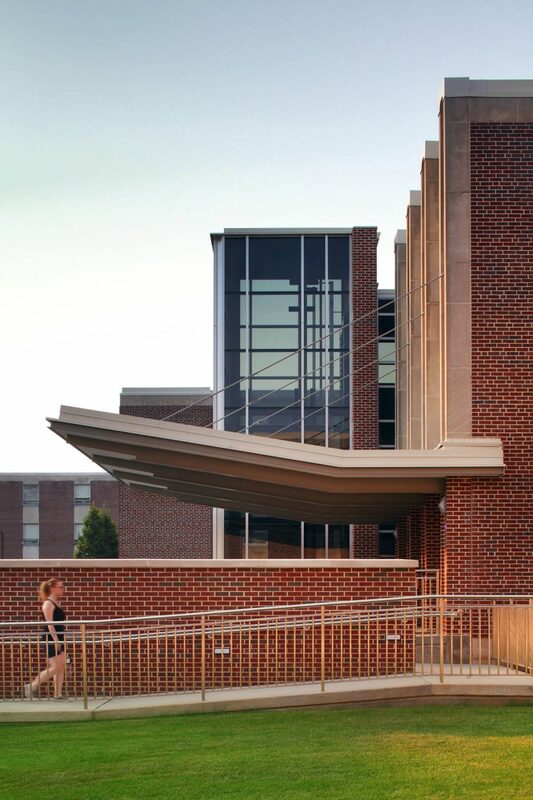 While some colleges and universities have opted to update their housing by building brand-new dorms with modern suite-style living, Kutztown was committed to the traditional style of dorm Lehigh Hall offered. The University believes suite-style living isolates students, as they no longer have reasons to interact in the corridors, common rooms or study lounges because most amenities are included inside the suites. Instead, Kutztown’s goal was to renovate the existing dormitory to provide students with upgraded facilities to meet their needs. The University engaged SFA in expanding and renovating Lehigh Hall. SFA designed a complete renovation, including the upgrades of common spaces, addition of an elevator, removal of built-in furniture, improved lighting, and an HVAC replacement. The Lehigh Hall project was a part of the University’s larger effort to renovate their Tri-County dormitories and courtyard. Following the completion of Lehigh Hall, Spillman Farmer was engaged to complete nearly identical renovations at the remaining two dormitories: Berks Hall and Schuylkill Hall.